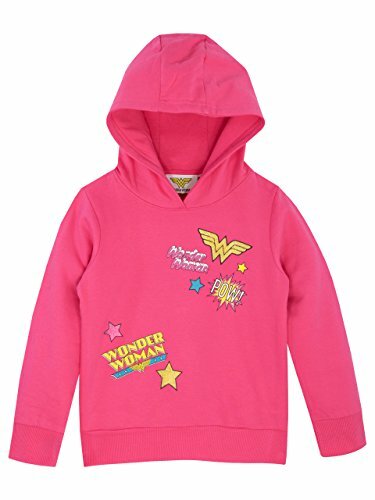 Girls Wonder Woman Hoodie. Even Princess Diana of Themyscira needs to keep comfy and warm on those colder days, and this fun pink hoody is just the thing she needs to go onto her next adventure! This vibrant sweater comes with glittery Wonder Woman badges, her logo and even comic details like 'Pow' and colorful stars, as well as a cosy hood and elasticated cuffs to battle the cold with. Made of high quality 100% cotton this jumper is a must in her heroic wardrobe collection! When she's not busy fighting off evil and saving the world, she can get comfy in this vibrant Wonder woman hoody!